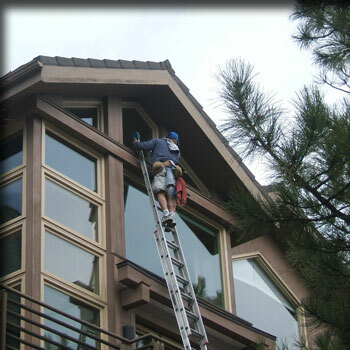 Fontaine Brothers Window Washing has almost two decades of combined window washing experience. We specialize in upscale residential, construction clean up, and store fronts up to three stories. Booties are always worn on the inside of your house, and drop cloths used to ensure no stray drops of water come into contact with your floor and furniture. Storm windows and screens are disassembled and washed. Exterior windows are wet scraped using specially designed blades to safely and effectively remove all bug matter, bird droppings, tree sap, and paint over spray. Windows are then washed the old fashioned way with a strip washer and squeegee to leave them streak free. Frames and sills are wiped clean. On the inside, we handle moving any furniture if necessary, and the process is repeated. Screens and storm windows are put back, and all furniture is returned to place so the only evidence we were there are clean windows. Ask about any additional services we offer: Light fixture cleaning, screen repair, chandelier cleaning, gutter cleaning, pressure washing, and window tinting.